This is one of seeking items from collectors all over the world. It's rare. This is one of 4 postcards issued in 2010. 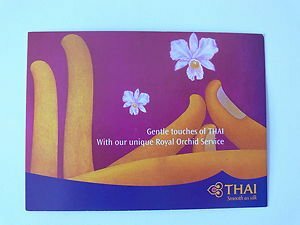 This postcard has Thai Art of hands along with orchid, Thai Logo with wording "Gently Touches of Thai - With our unique Royal Orchid Service". Don't miss it. o Product is shipped within next business day after payment is completed. Please note that image, size and Description may vary from actual product due to manufacturer Product updates or computer monitor color shading. Worldwide in good package delivered by Non-Registered Air Mail or SAL. However, Registered Air Mail is highly recommended, only US$ 2.00 more. It’s reliable. Delivery Period: 85% of shipments reach most clients within 10-14 days but could take up to 30 business days. Thailand Post recommends 7-30 business days. Insurance: US$2.00 (Optional). Please note that I am not responsible for uninsured shipments. Product is shipped within next Business Day after payment transaction is completed. We ship to PayPal confirmed address ONLY. Please make sure your address in PayPal is the same as your shipping address. To expedite the shipping period, DHL (3 to 7 Days) is available for faster delivery; please contact us via eCrater message. We will ship to all destinations. If you are in Germany, Italy, Spain, France, Africa, or other countries with different standard mail services, please be aware that the mail may be very slow (Due to postal service)! Please be patient...sometimes takes up to 4 or more weeks for delivery. Use express service is recommended. Combined Shipping for Multiple Items: Available, please contact me via eCrater message for each additional posters paid in the same payment transaction (except free shipping items). Winner/Buyer, please contact us within 3 days after auction closed or Buy-It-Now is fulfilled. Payment must be completed within 7 days of close of auction. Otherwise, we reserve the right to relist the item and go through Non- Paying Bidder alert program automatically. Please leave me positive feedback with 5 stars on all DSR score. We will leave POSITIVE FEEDBACK after payment completion. Please kindly give us 5-star rating on all DSR Score. We put our best effort to make you satisfied and always try to have precise description with clear and accurate photos. If description or photos make you confuse, please send us eCrater message, we'll answer you as soon as possible. If there is any issue, please contact us before leaving us non-positive feedback and/or less than 5 star rating. We will try our best to serve you. We'll always communicate with you and try to resolve the as soon as possible. If in any circumstances that you are not satisfied with our products, please send them back to us within 7 days after receiving the items. We will issue you 100% store credit, excluding shipping fees. The credit will be given within 2 days after the items received (REGISTERED MAIL SUGGESTED). Please note that returned merchandise should be in good condition, open package is ok to return.